The Achang are one of 55 minorities officially recognized by China. In Myanmar the Achang, traditionally known as Mongsha, are culturally and historically linked to the Shan. There is speculation that the Achang were originally Zaiwa who moved east to their present location. The Achang have a rich heritage of singing ballads and telling folk tales to each other. These stories are the main way Achang culture and history are passed down to children. The Achang claim to have once lived in a matriarchal society in northwestern Yunnan. After the Achang migrated to their present location, they began to rely more on farming and less on hunting to feed themselves. During the Ming and Qing dynasties (1368-1911), the Achang were ruled by hereditary chiefs. 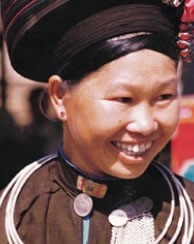 Achang women wear colorful skirts and wrap dark cloth high upon their heads. Traditionally, unmarried women tie their pigtails together on top of their heads. During an Achang funeral, a cloth ribbon, 10 to 20 meters (11 to 22 yds.) long, is attached to the coffin. A Buddhist monk is hired to walk in front of the procession holding the ribbon, which signifies the monk leading the soul of the deceased to the afterworld. Although they are nominally Theravada Buddhist, the older generation of Achang exhibits many traits of polytheism and animism in their religious rituals and everyday lives. Most Achang homes have posters of deities and demons pasted on their walls. However, there are also some Christians in nearly every Achang village in China. The present generation, having been educated in atheistic schools, is gradually forsaking the religious practices of their parents. A 1989 study reported that the Achang had "at least one known Christian". The situation appears to have improved rapidly; by 1992 the same source reported there was a church in nearly every Achang village in China. A strong, vibrant church also exists directly across the border among the Jingpo (Kachin), as well as among the Achang of Myanmar. Members of the new Achang church are often invited for training in northern Myanmar. 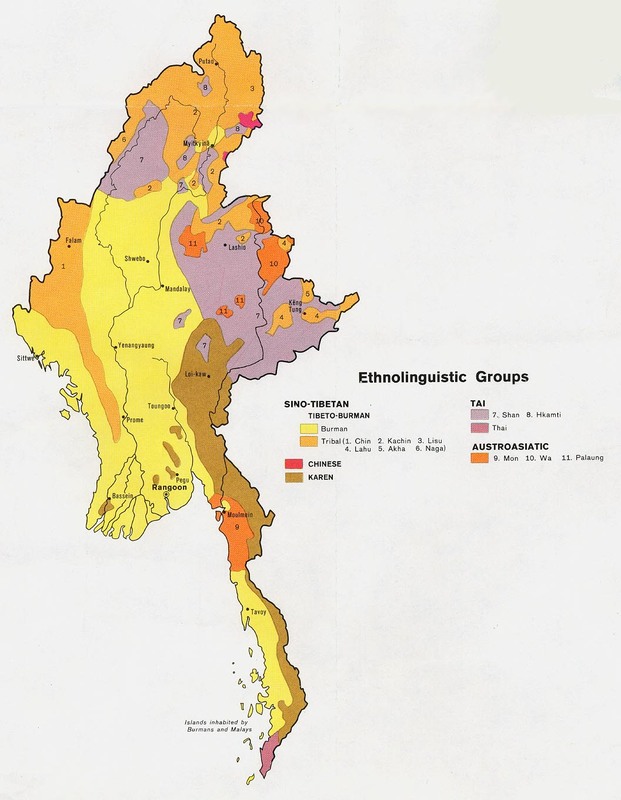 The Achang New Testament was completed in 1992, using a script that was invented specifically for the Achang in Myanmar. View Achang, Maingtha in all countries. 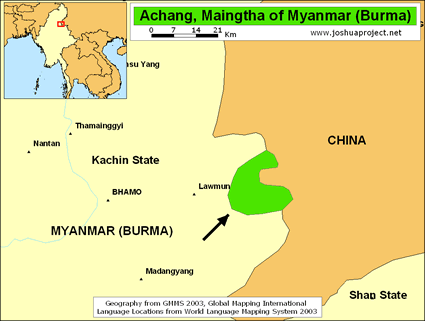 Location in Country: Kachin State, Waimaw and Japhwi townships, west of Ayeyarwaddy river near Bhamo (locally known as Manmaw), scattered among the Lashi [lsi] language area; China border.